Those who spend long stretches of time seated in a chair or wheelchair may require the use of a pressure relief cushion to reduce their risk of pressure sore development. The Sidhil Serenade Pressure Relief Cushion is designed with this in mind, and is constructed from two layers of foam, including a castellated top layer to reduce shear forces. 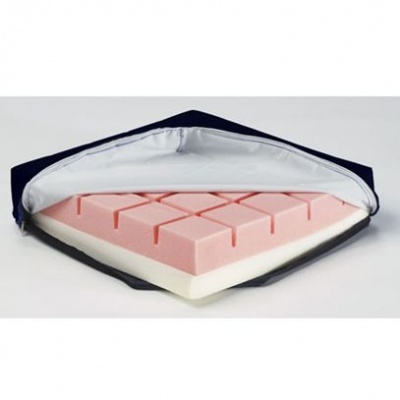 With a dense foam layer on the base for support and stability, this cushion is suitable for those at high risk of pressure sore development. The Serenade Pressure Relief Cushion is manufactured from two grades of pressure relieving foam. The top layer is cut and scored into squares to provide additional relief, making the cushion appropriate for those at high risk. Square in shape, the cushion distributes weight and pressure more evenly to help reduce the risk of sores. This makes it an excellent all-round choice for use in chairs and wheelchairs. The polyurethane vapour-permeable cover makes the cover more durable and protects the foam from being in direct contact with the user. Please be advised that the Sidhil Serenade Foam Pressure Relief Cushion is usually delivered within 1 week of your order being placed. We would advise you to consider this delivery estimation before placing your order. For more information, please contact our Customer Care Team at 020 7501 0592.